The delightful sounds of abundant birdlife is constant and only the clamour of monkeys interrupts their melodies. Beautifully coloured butterflies flitter through undergrowth, squirrels scurry from branch to branch in the canopy and occasionally, miniature deer are seen on the track leading through the rainforest. 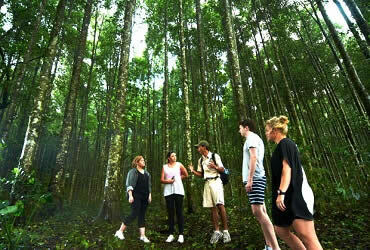 Our experienced Bali Jungle Trekking Tour guide leads you through this wonderful world of nature pointing out plants and flowers of interest, explaining their benefits to mankind and to local fauna and stops to show you the best views in the area.